Over the course of his 20 years in a range of companies including global marketing and startups, Ford has seen the role of the CMO evolve considerably towards a business-driven position that puts relevancy at the heart of the marketing mix. “CMOs have to span the spectrum of questioning whether you are just a cost centre or a key business driver,” he said. In one of his previous roles, Ford was the VP of global business marketing at Oracle, reporting to the CMO. It was there he began gaining valuable insights into how the software giant acquired companies and aligned specific industry verticals. “It was about being able to focus on specific industry verticals in order to determine how to take that industry domain expertise and create a bigger and more powerful story and really learn what enterprise marketing was,” he said. In 2013, Ford brought his decades of expertise to his role as CMO of LogMeIn, a US-based provider of software-as-a-service and cloud-based remote connectivity services for collaboration, IT management and customer engagement. “I really wanted to focus on a high-growth company focused on a number of different areas and a number of different products – and find new ways of filling out the full suite of the marketing strategy and all of the functions you would associate with a fairly broad marketing organisation globally,” he said. Ford’s current responsibilities include looking after LogMeIn’s overall global marketing strategy, as well as a range of responsibilities in product marketing, positioning, communications, PR, analytics, Web marketing and ecommerce activities. “LogMeIn really pioneered this idea of freemium, where the product is free and you work to delight the customer and drive usage, and eventually they convert and buy over time,” he explained. 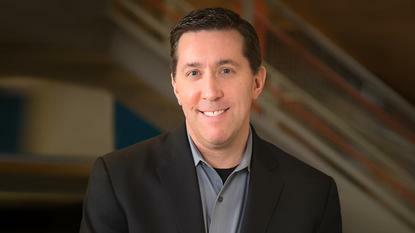 From a marketing perspective, LogMeIn operates in the collaboration space, which he estimated was a $3-$4 billion marketplace, as well as within identity access and management, a $4 billion plus marketplace. The vendor recently acquired password manager, LastPass, and is also looking to its role in the emerging Internet of Things sphere. According to Ford, the IoT opens a whole new world of possibilities for marketers to leverage the connected customer in order to stay relevant. When it comes to innovation in the digital marketing space, the IoT opens up a vast array of possibilities for marketers, he claimed. For Ford, technology marketers need to be constantly refining their brand to accommodate to the rise of millennials and stay relevant. “All while you maintain your core value proposition of being simple and easy to use, and while in the midst of trying to add the capabilities that you would need to remain relevant as a strategic collaboration tool,” he said.